By the early seventies, the West German music scene was thriving. Across the country, new bands were being formed, and releasing new, ambitious, innovative and experimental music. This had been the case since the late sixties, when the first wave of new bands were formed. One of the earliest groups were Amon Düül, who were formed in Munich 1967. Originally, Amon Düül began life as a radical political art commune. Later in 1967, a group of musicians within the commune formed the band, Amon Düül. It would become famous for their free form musical improvisations. Soon, new groups were being formed across West Germany. Among them, were Amon Düül II, Ash Ra Tempel, Can, Cluster, Faust, Guru Guru, Kraftwerk, Neu!, Popol Vuh and Tangerine Dream. Each of these groups were musical pioneers, who experimented musically, by pushing musical boundaries and combining disparate influences and genres. Sadly, this music was way ahead of its time, and it was only later that these bands received the recognition that their music so richly deserved. They would eventually be regarded as among the most important German groups of the seventies. However, these groups weren’t alone in recording and releasing ambitious and experimental music. Across Germany, new bands were being formed in towns and cities. This included Ikarus, Kollektiv, Lava, McChurch Soundroom, Message, Sunbirds, Wake Up and Xhol Caravan. Despite their undoubted talent, and ability to record ambitious and innovative music, their recording careers were all too brief. Some bands recorded just the one album, while others recorded two and occasionally, three albums. Sadly, all too often, these albums failed to find an audience. It was a familiar problem. The music was way ahead of its time, and record buyers failed to understand such ambitious, experimental and innovative music. This was also the case with AK Musick, whose 1972 eponymous debut album AK Musick will be reissue on the Mental Experience label on 25th November 2016. It’s a welcome reissue of one of the rarest German private presses of the early seventies. The AK Musick story began in the early seventies, when Hans Kumpf was studying at a teacher training college in the city of Ludwigsburg, twelve kilometres from Stuttgart, in Southern Germany. One of the students was Hans Kumpf, a classically trained musician. That wasn’t surprising. Hans Kumpf had attended a school the specialised in music. Over the years, he graduated from recorder to flute, piano, trumpet and the clarinet, which became his main instrument. This versatility would later serve Hans Kumpf well when he decided to found a new band, AK Musick. At the teacher training college, Hans Kumpf decided to form a new group in 1972. That wasn’t surprising. Across West Germany, new bands were being formed, They ranged from the rock bands that were popular on both sides of the Atlantic, to avant-garde bands whose roots were in the free jazz movement. That was what Hans Kumpf envisaged, so he went in search of likeminded musicians. Soon, Hans Kumpf had found the likeminded musicians he had been looking for. He found them within the teacher training college. Just like Hans Kumpf, Alfred Lell, Angela Weber, Helmut Grab and Winfried Koch were all classically trained musicians. They all shared an interested in avant-garde music, are were keen to join Hans Kumpf’s new improv collective. This new improv collective, Hans Kumpf called AK Musick. There reasons for this were twofold. AK was an abbreviation of the German word for workshop; while Musick was a mixture of the English and German words for music. Now that the nascent band had a name, Hans Kumpf began setting out AK Musick’s musical philosophy. The new collective would take a different approach to music. AK Musick were determined to: “make music in a very democratic way.” Each member of AK Musick’s would have their say and it everyone’s opinion was equally valid. With their musical philosophy in place, AK Musick began making music. With each of the five members of AK Musick classically trained musicians, they were all on the same page musically. Classical music became the basis of their music. So did free jazz, improv and music of avant-garde composers, including Johannes Fritsch and especially Helmut Lachenmann. So much so, that Helmut Lachemann would accompany AK Musick to the studio when they recorded their debut album. That was still to come. Before that, AK Musick set about honing their sound. Soon, the five likeminded and classically trained musicians were ready to take their tentative steps onto the live circuit. They soon came to the attention of the organisers of 1972 German Jazz Festival. It was being held in Frankfurt, and AK Musick were booked to play at the Newcomer’s Concert. For a relatively new and unknown group, this was a huge honour. Every year, the Newcomer’s Concert featured the rising stars of German music. In March 1972, this included AK Musick. When they took the stage the audience numbered 1,000. Meanwhile, , the concert was being recorded live for German radio and television. Across Germany, listeners and viewers were able to hear and see AK Musick combined elements of avant-garde, free jazz and improv to create music that was ambitious and experimental music that was hailed as exciting and innovative. Just like many other German bands who recorded their debut album in the early seventies, AK Musick hadn’t a recording contract. This meant they had to finance the recording and release of their eponymous debut. That was why such care and attention had gone into planning the recording of AK Musick. “Time was money,” and AK Music would be recorded at the Bauer Studios, in Ludwigsburg on the 14th November 1972 in just three hours. That wasn’t going to be easy. Especially considering the amount of equipment AK Musick would use on their eponymous debut album. Each of the five band members switched between a variety of instruments during the recording of six track s. Founder Hans Kumpf played bassoon, clarinet, fiddle, kazoo, oboe, rattle, recorder, reeds, Styropor, trumpet, windlasso, zither and added vocals. Alfred Lell played cello, clarinet and windlasso. Winfried Koch switched between clarinet, ektare, flute, percussion, windlasso, recorder, tam-tam and added vocals. Meanwhile, Helmut Grab played jew’s harp, organ, Darbuka, windlasso, piano and zither. Angela Weber played windlasso and added vocals. Once the six tracks were recorded, work began on the release of AK Musick. 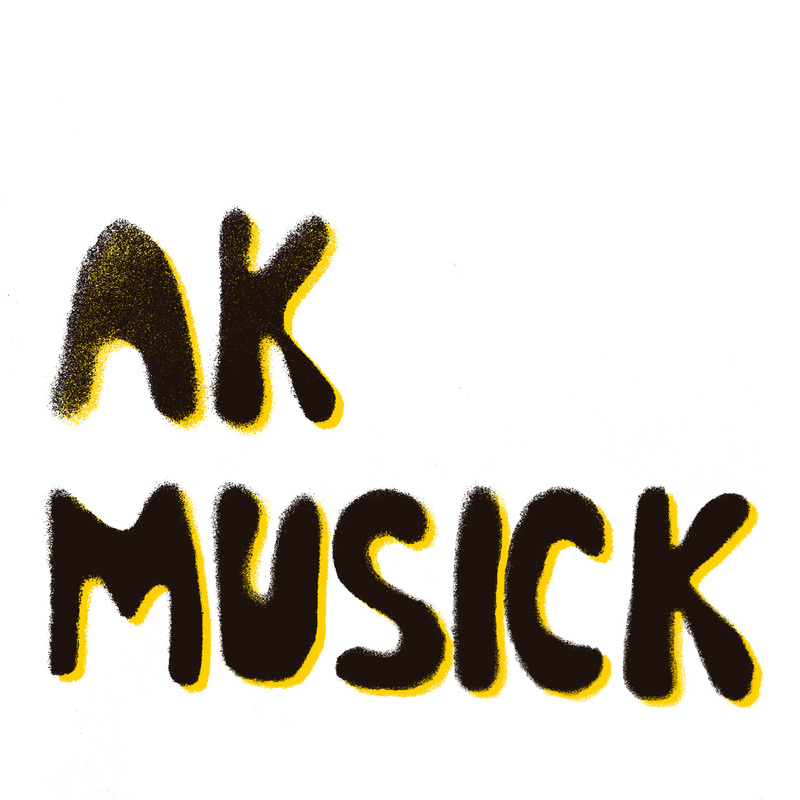 While some groups shopped their new album to major and independent labels, AK Musick decided to release their eponymous debut album on Hans Kumpf’s AKM Records. The only problem was money was tight. AK Musick could only afford to have 150 copies LPs pressed. This left no money to have a album cover professionally designed. So the members of AK Musick, and members of the Student’s Association spent a weekend in December 1972 at the teacher training college. For two days, 150 handmade album covers were made using templates and spray paint. These copies of AK Music were then sold in shops and at concerts. Nowadays, they’re extremely rare and valuable. A copy of AK Music will cost upwards of $700. That’s beyond the budget of most record collectors. Thankfully, AK Music will be reissued on the Mental Experience label on 25th November 2016. It’s the opportunity to discover one of the hidden gems of German experimental music, AK Music. Hava, which opens AK Music finds clarinets uniting. As one soars above the arrangement, another quivers. Soon, the other clarinets quiver and shiver. In the distance, hypnotic percussion bounces and draws closer. They join the braying, blistering clarinets as improv meets free jazz. AK Musick are at their most inventive, as they play with power and passion. The clarinets wail, soar and screech, before becoming melancholy, melodic and beautiful. As Shace unfolds, a piano plays slowly and thoughtfully, while a zither is plucked and percussion plays. They’re soon, joined by rasping trumpet, while someone knocks urgently on the piano. It’s transformed into a makeshift instrument, as a wailing modal trumpet soars above the arrangement.They’re joined by a whispering ethereal vocal and flamboyant flourishes of piano. After two minutes, the arrangement becomes understated and minimalist. Less is more for the next two minutes. Just a few subtle sounds escape from the arrangement, as members of the band improvise sounds like an early human beatbox. The less is more approach continues when the strings of a zither are caressed and plucked. This is the calm before the storm. A piano is pounded, the zither is plucked and array of percussion is briefly deployed. Soon, AK Musick then return to the earlier understated sound. Percussion shakes and rustles, while reeds are blown tenderly, producing a myriad of sounds and squeaks. They join the plink plonk and later, pounding piano and cooing vocal. Together, they play their part in captivating track that veers between understated to urgent, but always finds AK Musick at their most innovative and inventive. Straight away, there’s an industrial sound to Impro-vision, which is joined by a myriad of beeps, speaks, shivers, scrapes and rasps. Some are improvised by band members, while the reeds and trumpet weep, wail, shiver and quiver. Meanwhile, an improvised vocal whoops and shrieks almost hysterically as the trumpet brays. Weeping, squeaking sounds emerge from the depths of the arrangement, and they too have a melodic beauty. So does the free jazz piano and clarinet. They add a thoughtful, poignant sound, before dropping out. Replacing them are washes of ethereal, elegiac and later, otherworldly vocals. They’re part of a multilayered soundscape that not only captivates but, is melodic, and full of subtleties, surprises and nuances. A lone bassoon is joined by Angela Weber’s slow, heartfelt and elegiac vocal on My Ape and My Monkey. They’re soon joined bypercussion and a darbuka. It adds an African influence as it helps provide an accompaniment to the plaintive cry of the vocal. Later, though, the tempo rises and there’s an urgency to AK Musick. They improvise, as the track heads in the direction of free jazz. This is quite different from earlier. Still though, the haunting beauty of the vocal and African influence are omnipresent on this genre-melting track, where AK Musick continue to combined disparate genres and instruments. Closing AK Musick is Baz, where distant squeaks, beeps, wheezes, whirs and drone and draw nearer. They became part of a multilayered arrangement. It’s dark, eerie and otherworldly, as a cello plays, shrieks and shivers. Then dramatic bursts of dark music are unleashed by an organ. They sound as if they belong on a horror soundtrack. Adding to the darkness and drama, are the free jazz reeds and cello. They’re matched every step of the way by Angela Weber’s vocal. Her vocal soars high above the arrangement, as she improvises and transforms her vocal into another instrument. By 4.00 the arrangement is understated and minimalist, before taking on a cinematic sound. Again, it sounds as if AK Musick are creating the soundtrack to a horror film, as the music becomes variously dark, eerie, otherworldly and sometimes shrill and almost discordant. Other times, it’s melodic and spine tingling, but and always cinematic. AK Musick it seems, kept the best until last. Despite the undoubted quality of their eponymous debut album, AK Musick didn’t record a followup. Instead, they were just the latest in a long line of German groups who only recorded one album. However, AK Musick was a hidden gem of an album, which featured five multitalented multi-instrumentalists as they experimented musically, by pushing musical boundaries to their limited and sometimes beyond. To do this, AK Musick combined disparate influences, instruments and genres. This included avant-garde, experimental, free jazz and even elements of African, Berlin School, industrial music and Krautrock. The music of avant-garde composers Johannes Fritsch and especially Helmut Lachenmann influenced Hans Kumpf’s new improv collective. They recorded ambitious, experimental and innovative. Sadly, the music on AK Musick was way ahead of its time, and record buyers failed to understand this groundbreaking, genre-melting album. It was only much later that AK Musick received the recognition that their music so richly deserved. Forty-four years after the release of 150 copies AK Musick on Hans Kumpf’s AKM Records, the albvum is somewhat belatedly receiving the recognition it deserves. AK Musick is now recognised as an ambitious, important and innovative album. It’s also an album that even today, has the potential to influence a new generation of musicians. They will be able to discover AK Musick on the 25th November 2016, when it’s reissued by the Mental Experience label,which is an imprint of Guerssen Records. This will be the first time that AK Musick has been reissued since its release in 1972. Back then, only 150 copies of AK Musick were pressed. This makes AK Musick one of the rarest German private presses of the early seventies. That’s why copies are changing hands for upwards of $700. Not for much longer. After the 25th November 2016, AK Musick will be within the budget of anyone who is interested music. They’ll be able to discover the delights of AK Musick, which is a truly innovative and groundbreaking album of timeless music from Hans Kumpf’s improv collective. ← THE GIRLS WANT THE BOYS! SWEDISH BEAT GIRLS 1964-1970. Thanks for your kind words. I’m so pleased that you enjoyed my review. I thoroughly enjoyed reviewing what is a fantastic album. You must be really pleased to see the album being reissued? Copies of the original are incredibly rare. For someone like myself who has a huge interest in German music released between the late-sixties and mid-eighties, it’s a very welcome reissue. It’s just a shame that it was the only album AK Musick released. They were a very talented and innovative band.